The Deming Headlight Newspaper reported on April 26, 1918 that the Commander of Camp Cody was being transferred to Hawaii to take command of the American forces there. Major General A. P. Blocksom made many friends here in Deming since taking charge of Camp Cody. During the time that Major General Blocksom was the Camp Cody commander he had to handle many delicate situations. He has come to be known as an outstanding diplomat. He was able to maintain a friendly relationship between the army and the Deming civilian population. The Major General was wished the best of luck and success in his new command. Earl was the first born of 11 surviving children, child of Alice Ewing and Theodore DeMara (Demarest) from Sioux City. Earl’s grandfather, Granville Washington Demarest, was a Corporal for the Union during the Civil War, serving in Company E, New York 82nd Infantry Regiment. Earl’s father, Theodore DeMara (who altered his surname for unknown reasons), enlisted in the army at Ft. Sidney, Nebraska, in 1880. He was a private in the Cavalry, and he was discharged in 1885. Earl J. DeMara, was at Camp Cody in the summer of 1918. He is survived by his daughter, Marilyn June. Special thanks to Lacey DeMara for sharing these Camp Cody scans. Ninety years ago this week the Taxi Driver, known back then as Jitney Drivers, were on strike in Deming, New Mexico. The Army set the rate for the trip between Camp Cody and Deming at 15 cents per person. The Jitney drivers said to make a profit they needed to charge 25 cents per passenger. This caused most of the Jitney drivers to park their cars and make the Camp Cody soldiers walk back and forth between Deming and the camp. The taxi drivers held a meeting at Pine Street and Gold Avenue on Monday afternoon to complain about the lower rates. The crowd started out in good humor but a fight soon broke out and had to be broken up by the local police. Another meeting was held on Tuesday at the Cody Theatre were local business men urged the drivers to accept the ruling of the military officers and to continue there taxi servers. When this was put to a vote it failed by a slim margin. The Jitney drivers then decided to keep their cars in storage. The military believed that by stalling for time that most of the drivers would yield and return to work and get sufficient business to make a profit. The drivers believed that the military would have to change their position in order to get enough taxis to provide transportation for the Camp Cody soldiers. Both civilians and soldiers are debating the outcome of this standoff. I replace the pictures of Camp Cody in the “NEW” area of my main web site on the first of each and every month. 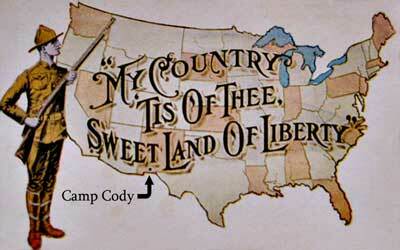 You can click the link on the right of this page to get to my “main camp cody site”. Then scroll down until you find the area labeled “NEW pictures. These pictures will remain there for one month and then be replaced with some never seen before Camp Cody pictures that I have received in the last month or so. Your donated scans of Camp Cody or of any soldier who served there are always welcome. Please fell free to send me an email, address on web site, or leave a comment on this Blog. I am now going to post stories from the 1917 local newspapers about Camp Cody and Deming, New Mexico. Michael Kromeke, Webmaster of the Camp Cody web site.